Artist's concept of a dangerous asteroid heading toward Earth. There's no reason to fear a devastating asteroid strike next month, NASA experts say. For the last few months, rumors have circulated on the Internet that a big asteroid will slam into Earth near Puerto Rico between Sept. 15 and Sept. 28, wreaking widespread destruction throughout coastal regions of the United States, Mexico, the Caribbean, Central America and northern South America. "There is no scientific basis — not one shred of evidence — that an asteroid or any other celestial object will impact Earth on those dates," Paul Chodas, manager of NASA's Near-Earth Object office at the Jet Propulsion Laboratory in Pasadena, California, said in a statement. "If there were any object large enough to do that type of destruction in September, we would have seen something of it by now." Astronomers based at the Near-Earth Object office and other institutions around the world use a variety of telescopes to hunt for potentially hazardous asteroids and comets, and they haven't observed anything that poses a serious threat to Earth for the foreseeable future, NASA officials said. 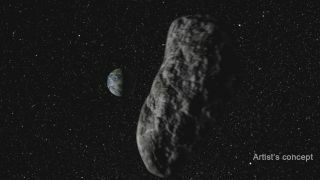 "Again, there is no existing evidence that an asteroid or any other celestial object is on a trajectory that will impact Earth," Chodas stressed. "In fact, not a single one of the known objects has any credible chance of hitting our planet over the next century." Experts such as Chodas must increasingly wade into the Internet's murky waters to debunk the myths swirling there. In 2011, for example, rumors grew that the harmless comet Elenin was a "doomsday" object that would inflict severe damage upon the Earth. And some conspiracy theorists claimed that a cosmic impact would wipe out humanity on Dec. 21, 2012, the day that one cycle of the Mayan long-count calendar came to an end. Just this year, fears were raised about the near-Earth asteroids 2004 BL86 and 2014 YB35, which flew harmlessly past the planet in January and March, respectively — just as NASA scientists had predicted the asteroids would. All of this is not to claim that Earth won't get hit by a cosmic object next month. The planet is pelted by dust and chunks of space rock all the time, but almost all of this material is so small that it burns up harmlessly in Earth's atmosphere.